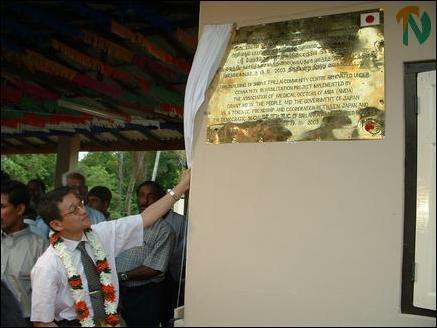 The First Secretary of the Japanese Embassy in Sri Lanka, Mr. Hideyuki Onishi, Wednesday afternoon declared open the renovated building of the Madduvil Srivetpillai Community Center in Chavakachcheri in the Jaffna district at a cost of one million rupees funded by the people and the Government of Japan as a token of friendship and cooperation between Japan and Sri Lanka. The implementing agency was the Association of Medical Doctors of Asia (AMDA), sources said. 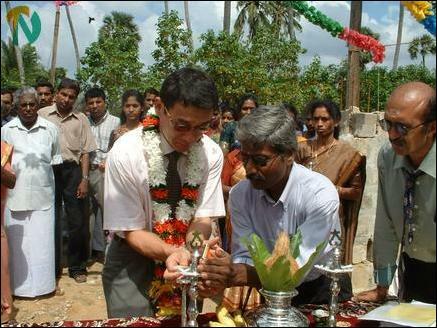 The community center building was destroyed in the military operation launched by the Sri Lanka Army in the year 2000, civil sources said. President of the Community Center, Mr.K. Perinpanathan, presided. The Chavakachcheri political head of the Liberation Tigers, Mr. M.Thamilmaran, unveiled the name board of the renovated building. The Project Director of the AMDA, Ms C.Yoshimi, and AMDA's district co-ordinator, Mr.Hiroyuki Okasaki, also participated in the event, sources said. 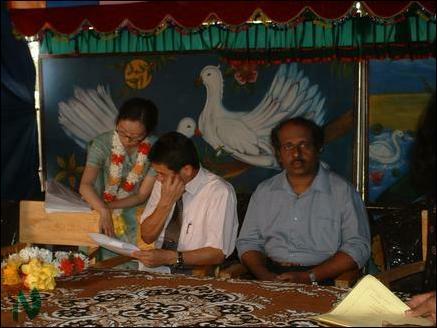 At the commencement, guests were taken in a procession from the nearby Pillaiyar Temple. The Thenmaradchchi Divisional Secretary, Mr.S.Srinivasan, and Chavakachcheri Pradeshiya Sabah Secretary, Mr.N.Balachchandran, also attended the event. The Japanese embassy official later handed over a consignment of electronic equipment to the center and water pumps to the farmers of the village, sources said.